During the 109 years of the existence of the Industrial Workers of the World (IWW), there have been many organizers and members whose name has come to prominence within the union. Some were respected, a few have been hated, and others triggered feelings that are a mixture of the two. 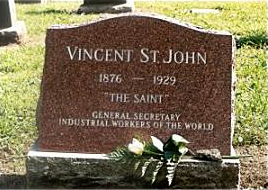 But arguably, no one has been as admired in the IWW as Vincent St. John. Nicknamed ‘The Saint’, St. John was born to parents of Irish-Dutch ethnic background in 1876. For the next 15 years, his family moved around frequently, residing in 4 different states before finally settling in Colorado in 1895, when St. John was 19 years old. In Colorado he began working as a miner and union organizer. Within 5 years, at the age of 24, he was elected President of his Western Federation of Miners (WFM) local in Telluride. The next year, the Telluride local was involved in a hotly contested strike. One of the mine owners organized an anti-union ‘Citizen’s Alliance’ to oppose the striking miners. Scabs were armed and deputized by the police. In response, St. John ordered 250 rifles and 50,000 rounds of ammunition for the union. As the strike dragged on, a confrontation between scabs and strikers occurred, in which shots were fired and a few men were killed. At the end of the battle, the scabs withdrew and the strikers occupied the mines, foreshadowing the sit-downs and occupations that were first done by the IWW in 1906, and then followed by the CIO and independent unions in the 1930s. After the strike died down, a year later, the mine owner, Arthur Collins, who had brought together the ‘Citizens Alliance’, was shot and killed. Although little evidence existed to implicate St. John, he was harassed by police and blacklisted from mining work for years because of this. Around this same time, and adding to the mythology of his nickname, St. John was involved in the rescue operation of a mining disaster. He was considered a local hero, although he contracted chronic bronchial asthma for his efforts, which is believed to have contributed to his early death. Radicalized by his experience as a miner in the American West, St. John’s was considered on the ‘left-wing’ of the Western Federation of Miners. When the WFM became one of the founding unions of the IWW, he threw himself into IWW work, as well. He also apparently became a member of the Socialist Party, even running for office at one point. At the 1906 General Convention of the IWW, he was one of the main members of the ‘revolutionary unionists’, who sought to and succeeded in ousting the President of the IWW, Charles Sherman, seen as too conservative, and abolishing his position. St. John also was elected general organizer. In the same year, he was arrested in the Coeur d’Alene area of Idaho, probably for union agitation. At the end of the year, and running into 1907 he was heavily involved in the Goldfield strike in Nevada. Goldfield, Nevada, now a ghost town, was during this time a booming mining area of around 20,000 people. 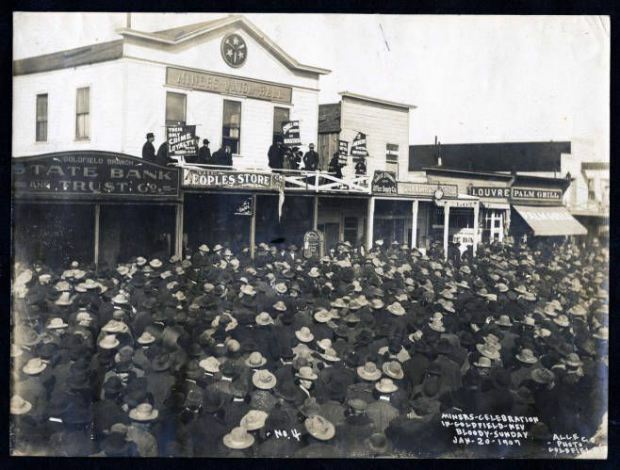 The strike by the now IWW affiliated Western Federation of Miners was met by a ‘Citizens Alliance’ again, as well as martial law and federal troops. Although, the town workers organized with the IWW went on a sympathy strike, the federal troops entry into the situation gave the mine owners strength, which they used to slash wages and declare an open-shop policy. St. John was once again implicated in a murder with little to no evidence, this time of a local restaurant owner. Further complicating matters for the strike and St. John was a jurisdictional dispute between the WFM and an American Federation of Labor (AFL) carpenter’s union, which seemed to have spilled into violence with St. John being shot in the hand, possibly by an AFL member. His hand was disabled for the rest of his life. Despite the strike being considered a loss, it did win the eight-hour day, some wage hikes and other benefits. But the experience led to the WFM leaving the IWW and St. John either leaving or being expelled from the WFM later that year. At the IWW’s convention in 1908 he presided as chair. Although hesitant to bring it the floor, St. John ended up siding with the ‘direct actionists’ vs the ‘political socialists’ such as Daniel DeLeon. He also was elected General Secretary, a position he held until he left the union. Upon entering office, he found the union in a deep financial crisis and suspended the Industrial Union Bulletin, a publication with roots in the ‘revolutionary unionist’ faction of 1906. In 1914, possibly exhausted after years of organizing battles and factional fights, he resigned as General Secretary and went to the Southwest to be a prospector. Despite this, he was still rounded up in 1918 during the U.S. government’s wartime persecution of the IWW and went to trial with 101 other Wobblies. Even though St. John was a labor radical with little illusions in the justice system, the 20 year sentence handed down shocked him. “I did not think that mob justice would prevail in a U.S. court”, he said. He served 2.5 years in Leavenworth, before being pardoned. Upon his release, he apparently rejoined the IWW, which was in the middle of a conflict with the newly established Communist Party USA, which was trying to win Wobblies to their party. He sided with the anti-CPers. Very little is known about what St. John did between his immediate release and his death at the age of 56 in San Francisco. He was buried in an unmarked grave in Oakland, which was eventually given a proper headstone nearly 70 years later.